Find out what’s on in Somerset in August 2016 with our selection of great days out for adults and children, including festivals, fayres and fireworks. Meet the specialist Tudor Archers of Montacute House and have a go at shooting arrows (at balloon targets only, of course!). Set in a hand-painted pavilion tent complete with royal standard and Tudor rose flags, there will also be replicas of armour and weapons on display so you can get a feel for what Tudor times were really like. If your children love tales of the knights of old, this could be the perfect day out for them. At Dunster Castle they will be able to experience first hand what it was like to be a knight in the past, with the chance to create their very own helmet and try jousting on wooden hobby horses. On Puppet People day, children aged from three to six can use craft materials to make their own fun wooden spoon character to take home with them. There’s no need to book, so you can take your time looking around the gallery before and after – this summer’s exhibits include ‘Carnival’, a collection of hand-painted wooden carvings by Columbian-born artist Carlos Zapata. Dating back to the 1960s, this festival had a hugely successful relaunch last year, with 45,000 visitors coming to see the prize livestock and events on offer. This year’s line up promises to be even better, with a poultry show and sale, craft fair and food market, petting zoo, dog and duck show, and demonstrations including milking and sheep sheering, plus live music and plenty of food. This annual steam fayre and rally, held in the pretty village of Norton Fitzwarren, showcases a fantastic collection of working traction engines, tractors and road rollers for steam enthusiasts, as well as other vehicles such as vintage cars and motorcycles. There will also be live music, a huge craft market and children’s entertainment including rides. Don’t miss this magical opportunity to visit the beautiful Ham Wall National Nature Reserve at dusk. Look out for creatures that are just waking up in the wild such as marsh frogs, bats, owls and moths. Make sure you bring a torch and the whole family for this nocturnal adventure. Booking is essential. Kick back with friends and family and enjoy a summer’s night with a delicious pint and some great live music at the Backdown Hills Beer and Music Festival. There will be a handpicked selection of over 40 brands of beer and cider to try as you listen to the sound Mad Dog Mcrea, Jason Baxter and Tamsin Burt, among others. Don’t miss the family fun afternoon on the Saturday, with crazy golf, gladiator jousting, mega slide and loads more. Forget walking round in studious silence – this is one museum where you’re guaranteed an action packed, thrilling day out, especially if you go on Live Action Day. The Vertical Trix stunt team will be performing for the first time at the Motor Museum with their impressive tricks and eclectic collection of stunt cars. You can also book in advance to get the chance to drive your dream car. 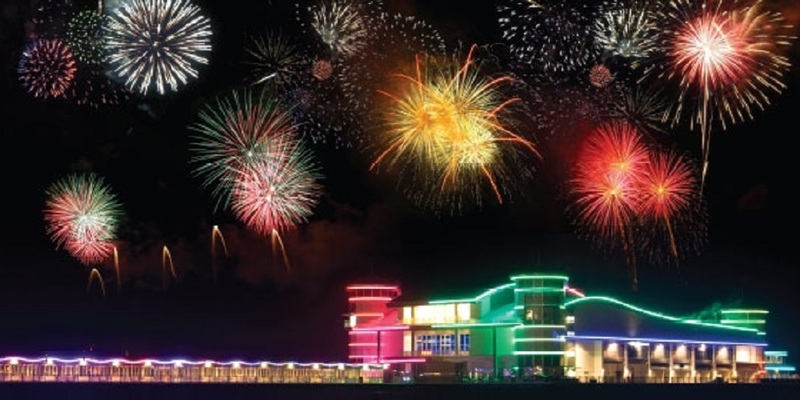 Get the perfect view of this stunning coastal firework display from Weston-Super-Mare’s legendary grand pier. You’ll need to book a ticket in order to gain access to the pier, but the good news is that the price of your ticket includes unlimited turns on the pier’s fantastic collection of rides! You’ve heard of car racing, horse racing and dog racing… but how about lawn mower racing?! See top of the range mowers and their owners battle it out in the mud to become the next mower racing champion, as well as enjoying the live music, vintage cars and local beers on offer.